I received an email from the Victoria Gallery & Museum alerting me to the fact that an exhibition of work by Adrian Henri was ending that day. Henri has a special place in my heart because I arrived in Liverpool just at the tail-end of that moment when Liverpool in the1960s was a focal point for popular culture. Henri was the leading figure of a multimedia scene in which art, music and writing were closely connected. I remember fondly the performances – a heady mixture of poetry, jazz and acoustic guitar – by the Liverpool Scene, every Tuesday evening in the upstairs room at O’Connor’s Tavern on Leece Street. The band featured poets Adrian Henri, Mike Evans (who would write the Guardian’s obituary of Henri in 2000) and Mike Hart (who died, aged 76, last June) accompanied by guitarist Andy Roberts. 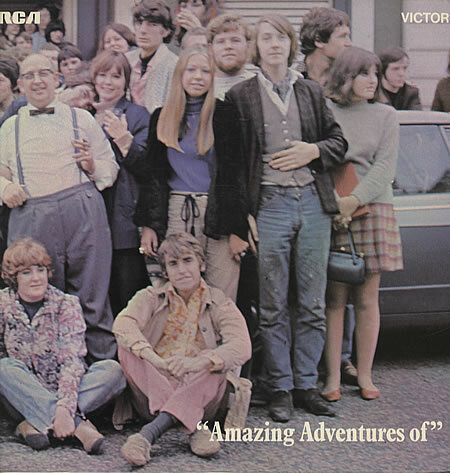 For this reason the cover of the Liverpool Scene’s first album, The Amazing Adventures Of, a bit special for me, since it shows the regulars outside O’Connor’s Tavern with the landlord, Jimmy Moore (the guy in the braces). The Liverpool poets, and particularly Henri, drew a lot of their inspiration from Liverpool itself, and sought to make their work relevant by reflecting experiences that their audience would identify with. The first exhibit in Adrian Henri: Poetry and Painting 1960-2000 at the Victoria Gallery was a perfect example of this aspect of his work. He famously described the city as ‘at the present moment the centre of the consciousness of the human universe. They’re resurrecting the human form divine there – all those beautiful youths, with long, golden archangelic hair’. Henri recalls taking Ginsberg to the Cavern and other venues to taste Merseybeat first hand, drummers from local beat groups jamming with the Beat legend, who played Tibetan rhythms on a set of finger cymbals. The Entry of Christ into Liverpool was both a painting and a poem. The exhibition featured a print of the 1964 painting alongside a limited edition print of the poem published as a poster by the ICA. Henri’s painting is an hommage to James Ensor’s 1888 painting, The Entry of Christ into Brussels in 1889, a forerunner of 20th-century Expressionism. Henri must have seen Ensor’s painting of Christ entering contemporary Brussels in a Mardi Gras parade – with its melange of religion, politics and art, and its crowd of masks, faces and caricatures representing historical and allegorical figures, along with Ensor’s family and friends – and imagined how he might celebrate Liverpool’s vibrant culture in the same way. James Ensor appears to the rear of Henri’s painting, playing the part of Christ. In front of him is Alfred Jarry, and forerunner of dada and Surrealism, riding a bicycle. In front of Jarry is the distinctive figure of his creation, Pere Ubu. Also present in the crowd are: Sam Walsh (painter), Pat Dawson (a friend of Henri’s wife, Joyce Henri), Mike Wenblatt (hairdresser and jazz musician), Roger McCough (poet), Arthur Dooley (sculptor), John Gorman (later member of Scaffold), Charlie Parker (jazz musician), Carol Mazanovitz (Henri’s lover and former girlfriend of Stuart Sutcliffe), Mike Evans (musician and poet) and his girlfriend Josie. In front, from left to right, figures include: William Burroughs, Mark Rushton (a friend and student of Adrian Henri’s at Manchester Art College), Stanley Dobbin (a printmaker from Manchester), Phillip Jones Griffiths with camera (a school friend of Henri, later a celebrated photographer of the Vietnam war), Pete Brown (beat generation jazz-poet who later wrote lyrics for Cream), The Beatles, Charlie Mingus (jazz bassist, wearing a highly decorated robe), George Melly (jazz vocalist and writer) with his wife Diana, and Don McKinlay (Liverpool artist). None of these figures were painted from life. Instead, Henri painted a mental image he had of each person wearing particular clothes that he associated with them. At the time I wrote that poem I was just starting to do a regular music thing with The Liverpool Scene. I turned up one evening with this thing I’d been writing on and off for about five years. It grew out of notes for a painting for a start. I was doing a painting and collecting all kinds of information and a lot was just written on pieces of paper. There were things like the Guinness sign in Lime Street that went on and off one letter at a time. I found these bits of paper years later and started to work on it and it turned into a poem. city morning. dandelion seeds blowing from waste ground. Jarry cycling carefully through the crowd. empty chip-papers drifting round my feet. Read the complete text here. Listen to Adtian Henri recite the poem in the YouTube video at the end of this post. Years later, Adrian Henri would make a similar painting to The Entry of Christ. As in the earlier work, The Day of the Dead (1998, not in exhibition) would situate an event from another time and place in Liverpool, and populate it with Henri’s friends and artists and writers of cultural significance – most notably Malcolm Lowry (the white suited, pipe-smoking figure on the far left), the alcoholic author of Under the Volcano who grew up in Birkenhead. The novel is almost entirely set on the Mexican Day of the Dead. In the painting, among the figures in the crowd are: William Burroughs, Allen Ginsberg, Frida Kahlo, Ed Kienholz and Henri’s Liverpool painter friend, Sam Walsh. The grandson of a seaman from Mauritius who settled in Birkenhead, Adrian Henri was born in1932. He came to prominence as a poet alongside Roger McGough and Brian Patten in the groundbreaking 1967 Penguin anthology The Mersey Sound. He had trained as an artist at King’s College, Newcastle under Victor Pasmore and Richard Hamilton. Like his poems, his visual works in the 1960s drew on popular icons, consumer products and cityscapes – irreverent, humorous, political, surrealistic and anchored in contemporary urban culture. The exhibition at the Victoria Gallery was curated by the art historian Catherine Marcangeli, Adrian Henri’s partner in the last fifteen years of his life. Better-known as poet and performer in the 1960s and 70s, Henri remained a prolific artist until his death in 2000, exhibiting nationally and internationally. Throughout his career, the same subjects – including birds, cuts of meat and flowers – were often explored in both painting and poetry; from the 1980s. It was interesting the way the garden was planted. It was planned both vertically and horizontally so that the plants were layered upwards. Alleys that you could go down were flanked by head-high plantings that flowered at different heights. Somehow this had the effect of flattening out the whole thing. In certain parts of the garden there was almost no feeling of perspective. It was all tipped up against you and even when you could see things at the front the whole thing was flattened out. This was a fine, but tantalisingly truncated exhibition that left me wishing for more, but happy to have seen these glimpses from a poet, painter and performer who never left his hometown, and upon whom was conferred the freedom of that city on the night before his death. Another relevant book, published the same year as The Mersey Sound, is The Liverpool Scene edited by Edward Lucie Smith. It was an anthology with black and white photos an the famous Ginsberg quote on the back cover. So many memories! I knew Adrian well together with many of those depicted in “The Entry of Christ into Liverpool”. Sam Walsh was a particular friend and we both lived on Gambier Terrace. Arthur Dooley was another good friend and made a metal sculpture of a fish as a 21st birthday present for my then wife, Polly. Along with many others, I had a brief fling with Carol (whose surname I remember as Masonovich) in 1961. She was incredibly beautiful and eventually became the partner of the Liverpool-trained sculptor, Ted Atkinson, moving with him to Wivenhoe. I never knew she had been Stuart Sutcliffe’s girlfriend but then it was pre-Beatles. Adrian was a lovely person, warm and witty, one of the best. The 21 Mount Street picture looks much later than 1964, it looks nearer to how the poets looked in 1983. Sorry to say this, but a great article otherwise, many thanks.